This is a spot prepared for Turkish Airlines (THY) Globally Yours campaign. It was not a typical job we’d take, since it did not really contain any challenging motion design elements, but instead was a pure editing and compositing project. 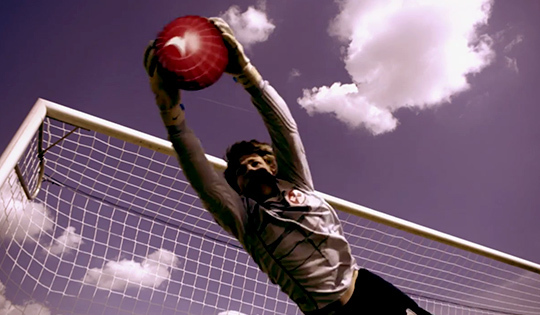 The ad is edited from a number of stock scenes, where our task was to replace the original balls with red, THY ones. The new ones were not to contain any characteristics of the real sports equipment (hairy tennis ball, ridges and patches on the football, etc.). The process was quite typical for this kind of job. We started with the edit, matching the length and speed of the clips to synchronize with the music. After that came the tracking, removal of the original ball, compositing the new one in. Whole thing was rounded up by color correction and grain matching.